Earlier this year, five student entries from the Lazaridis School of Business and Economics were selected from over 1,550 video submissions as part of the top 25% to proceed to the next round in the Great Canadian Sales Competition (GCSC). All second-year BBA students, the five semi-finalists were: Thomas Price, Angelo Fousteris, Sarah Alfonsi, Olivia Heins and Nick Cullen. 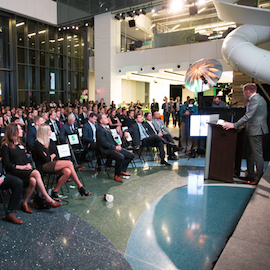 The GCSC is Canada's largest business competition, with representation from 70 different schools across the country. The first round required students to do a 30- to 90-second pitch on anything they’re passionate about, sharing why it’s better than the alternatives. The judges evaluated the student entries based on a good value proposition, confidence and credibility. Price pitched a start-up idea, Fousteris pitched coding, Alfonsi pitched an innovative fountain drink machine, Heins pitched face-to-face communication and Cullen pitched camp counselling. For the semi-final round, competitors were asked to work with one of the 25 sponsors to submit a single-take video pitch, this time thinking as a sales representative how to sell the sponsor as a business-to-business (B2B) company.